Your orange tree is really beautiful. We cannot grow them here. I think I have the same problem with my sugar apple tree. Lots of black ants on some of the fruits. I find it so much easier to grow fruit trees on the ground. You have done a great job with your potted oranges. Ants on your tree is a sign that they are interested in something. It is possible that they are "farming" some tiny bugs. They eat the secretions from aphids and scale insects and so they protect them as much as they can. Your oranges look wonderful Helen. 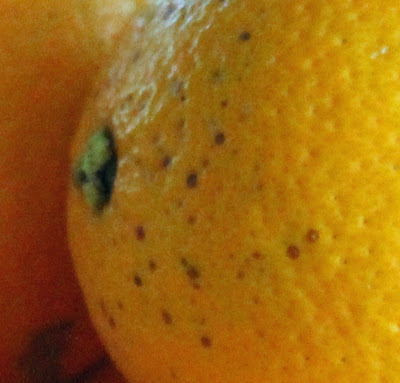 I only noticed the effects of the scale insects on the fruit when you mentioned it. Do you preserve your lemons? Or use them fresh? Bom - We use the lemons both ways. Because we have so many of them, every year we set aside a time to juice them. We put the juice in freezer bags. Each bag contains two cups of juice which is enough to make a huge pitcher of lemonade - ready for the summer. Sometimes we also make lemon curds to put on scones and pancakes. Helen, how wonderful to have a tree full of oranges even in a pot, and can just pluck them and pop in your mouth! So much information on those scale insects and ants on plants..Im always wondering why my plants got so many black ants! I showed my wife your post and she is now bugging me to try my hand at lemons. She likes preserving them in salt and olive oil to use for chicken and fish dishes. Beautiful Orange trees. In many ancient spiritual circles Orange-colored fruit (such as oranges, of course) were considered to be extremely healthy to the life force. I love oranges. That's an impressive first harvest of oranges. I can't wait to add an orange tree here. Thus far we only have the Meyer Lemon planted. I hate citrus scale, and battled with it for the some time at our last house. I used to grow a Eureka lemon in a pot, that was endlessly affected. For some reason though, once planted in the garden, the scale (and most importantly the ants) disappeared! Have you tried wrapping the trunk and applying Tanglefoot to the tree? I found that helped. Keeping the ants away, so they can't protect the scale from their natural predators, really seems to help. Hi Helen, in your reply to Bom i realized i am right for thinking that you are from here too. I thought you are in seeing your photo profile. You have lots of fruits from those oranges! We have some native varieties of oranges in Batangas, 6 trees, which gave us also lots of fruits. We sold most and gave a lot too. We were so happy too. Will the juice not become a bit bitter when preserved like that without any antioxidants?